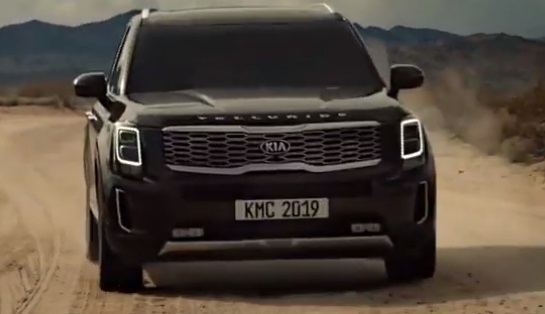 Kia showcases, in a new commercial, the 2020 Kia Telluride, that Cars.com named “Best in Show” at the 2019 Detroit Auto Show. The spot follows a 2020 Telluride SX with Prestige Package pre-production model with optional features as it’s speeding down a road through the desert, before a family gets onboard for a road trip. “It’s strong. It’s bold. It’s spacious. It’s powerful. But on the inside, it’s much more than that. It cares, gives, and embraces,” says the voiceover on the 30-second video, adding the tagline “The Bigger, The Closer. Telluride”. Serving as soundtrack is a catchy song whose lyrics include “Burn this soul”. Performed by a male singer, it was most probably specifically produced for this ad. Introduced as a concept car in 2016, the 8-seat mid size SUV built by Kia Motors debuted this spring as a 2020 model. Starting at $31,690, the Telluride features available AWD system w/ center-locking differential, 7 or 8 passenger seating, available reclining dual captain’s chairs, which slide forward at the touch of a button for 3rd row access, available dual sunroofs, standard USB ports for the rear passengers, as well, UVO link with available 10.25″ touchscreen w/ Head-Up Display, Driver Talk feature to amplify voice to rear passengers, Quiet Mode to only use front row speakers, four different drive modes – COmfort, Eco, Sport and Smart, and a suite of Integrated Styling Kia Drive Wise systems, like standard Forward Collision Avoidance Assist (FCA). The automaker has created a program called “The Great Unknowns Scholarship” to help young people who want to get a foothold in higher education, giving it everything to help them achieve their all. Applications will be open again in early 2020 for the next round of applicants.